Hydrangea macrophylla is a species of flowering plant in the family Hydrangeaceae, native to Japan. It is a deciduous shrub growing to 2 m tall by 2.5 m broad with large heads of pink or blue flowers in summer and autumn. Common names include bigleaf hydrangea, French hydrangea, lacecap hydrangea, mophead hydrangea, penny mac and hortensia. It is widely cultivated in many parts of the world in many climates. H. macrophylla blooms can be blue, red, pink, light purple, or dark purple. The colour is affected by soil pH. An acidic soil (pH below 7) will usually produce flower colour closer to blue, whereas an alkaline soil (pH above 7) will produce flowers more pink. This is caused by a colour change of the flower pigments in the presence of aluminium ions which can be taken up into hyperaccumulating plants. 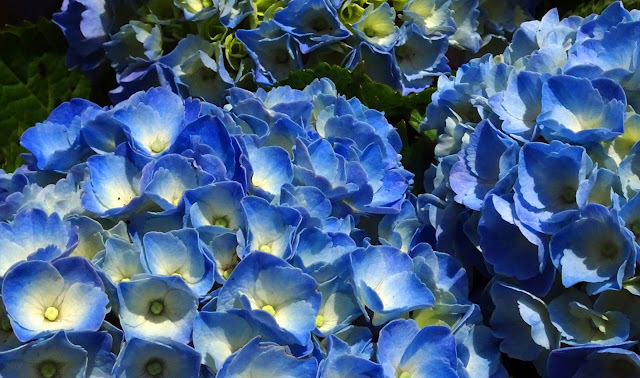 There are many proprietary 'bluing' chemicals that can be added to the soil around the plants to make the flowers blue. This post is part of the Floral Friday Fotos meme.